Sometimes life blindsides you. 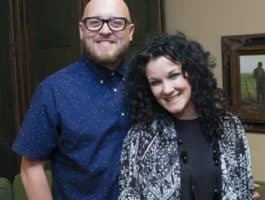 That's what Christian recording artist Plumb (Tiffany Lee) felt when her husband, Jeremy, told her he wanted out of the marriage. Holding fast to the Word, Tiffany tells how she gave her sinking marriage over to God, trusting Him for the outcome. Jeremy joins her in the studio. Bob: Tiffany Lee remembers the day she became very aware that her marriage was in trouble. There were friends over at the house, enjoying dinner. Tiffany: One of them asked how we met. They wanted to hear our love story of meeting on the ski trip and falling in love. I love to tell that story—so I’m telling the story. He walks by and hears me telling the story; and he goes, “Ugh, you’re telling that stupid story again.” I remember hearing him say that and just—it was like a bullet in my chest. [Emotion in voice] I knew something was wrong. I thought maybe he was just a little grumpy, but he had been thinking of leaving me. Bob: This is FamilyLife Today for Thursday, September 15th. Our host is the President of FamilyLife®, Dennis Rainey, and I'm Bob Lepine. So, what do you do when you realize your marriage is slipping away right before your eyes? We’ll hear today from Jeremy and Tiffany Lee. Stay with us. And welcome to FamilyLife Today. Thanks for joining us. We’re going to hear today a story of a couple whose marriage came to the brink, really. They were at the point where it did not look like the marriage could survive. As we hear this story, I’m thinking, Dennis, about the couples, whom we know, who have, in that situation, attended a Weekend to Remember marriage getaway. —they just want to do the preventive maintenance necessary to keep a marriage thriving—but there are some couples, who come, who are without hope. God has used the Weekend to Remember in the lives of tens of thousands of couples. In fact, it’s hard to calculate how many legacies have been altered because a couple took a weekend and got away, and focused on their marriage, and made some good choices as a result of that. I mention all of that because this week is the last week we’re offering a special offer to FamilyLife Today listeners. If you’d like to attend an upcoming Weekend to Remember marriage getaway—and we have about 40 of them coming up this fall—you can sign up today. If you pay the regular rate for yourself, your spouse comes at no additional charge—it’s a buy one/get one free opportunity. You can find out more when you go to FamilyLifeToday.com; or if you have any questions, call 1-800-FL-TODAY. The offer is good through this weekend. Right now is the best time to take advantage of this offer. Again, go to FamilyLifeToday.com; or call 1-800-“F” as in family, “L” as in life, and then the word, “TODAY.” Ask about how you can save money on your registration for an upcoming getaway. You know, you think about the challenges that come with trying to build a healthy, strong, vibrant, thriving marriage; and you think about people who are doing life in public—people who are known / public figures. I think the challenge is amplified there, because all of life is lived out in the open. Dennis: And Bob, with that responsibility of being a public figure, I think people tend to put you on a pedestal—where you don’t belong—where you’re not allowed to have problems—there’s the trap. We’re going to hear about that trap today. I mean, it’s a lethal trap for a lot of authors of Christian books, pastors, musicians, performers, Christian entertainers, Sunday school teachers. We find we can’t be honest and real about the issues that we’re facing. We have a pair of FamilyLife Today radio listeners—Jeremy, you weren’t a listener—your mom didn’t make you listen to FamilyLife Today? She’s a listener, but you’re not. She didn’t make you listen? Jeremy: She did make me listen, and she sends me your emails that she gets. She’s on your email blog—so she sends me those. Bob: You know, Jeremy, you can get on the email blog yourself. Bob: She uses them to preach. Dennis: Well, Jeremy is a self-professed come-to-the-game-late listener to FamilyLife Today—let’s just admit that. [He and] his wife Tiffany join us again on FamilyLife Today. Jeremy/ Tiffany—welcome to the broadcast. Bob: And listeners may not know who Jeremy and Tiffany are. Dennis: Well, and I didn’t mention their last name on an earlier broadcast; and again, today. Your last name is my middle name. Dennis: Yes; Lee. How about that? Tiffany: That’s my middle name too. So I’m Tiffany Lee Lee. Dennis: No wonder! [Laughter] She has a stage name—Plumb—with a “b,” not the p-l-u-m; that’s funny. Bob: And I have, right here, the Exhale CD. Is this your newest CD? Bob: And 14 tracks on this CD. Bob: So that’s awesome. You give us four more tracks than most artists do. Dennis: And she’s also the author of Need You Now. We’ve been listening to a story of how a marriage started off great and ended going through a very, very dark time. Bob: —a little stressed out. But there was a gradual isolation that was happening in your marriage. Bob: Do you remember when that thought first hit you? Tiffany: It was around Thanksgiving. I remember we had college kids over for Thanksgiving, who didn’t have family close. One of them asked how we met—they wanted to hear our love story of meeting on the ski trip and falling in love. I love to tell that story—so I’m telling the story. He walks by and hears me telling the story; and he goes, “Ugh, you’re telling that stupid story again.” I remember hearing him say that and just—it was like a bullet into my chest. [Emotion in voice] I knew something was wrong. Dennis: Let me stop you for a second. Jeremy, what occurred in your life that you had started moving toward separation, divorce, leaving your kids? I mean—you’re surrounded by the Christian community; and yet, you’re visiting a place that is in direct contradiction to everything the Christian faith represents. Bob: And that you’d never imagined you’d go. Jeremy: I think that I was separating. This was just where I was at—at the time. Jeremy: I was at a dark place, but I was separating being a good dad from being married to Tiffany. I was very involved in my children’s lives. I was like: “You know what? I can be a good dad without being married to her. I don’t have to be in this relationship to be a good dad,” which I know was a lie that I was telling myself to just sort of justify what I was feeling / to justify the disconnect. I think that I had just gotten to the place where, no matter what she said, I was upset—I was just done. Dennis: So, was the word, “divorce,” ever uttered by either one of you? Jeremy: It was not until that November. In fact, it was one of those things that we had said when we were dating—we would never discuss it / never even utter the word. Tiffany: Not even joke about it. Jeremy: So, until that—I guess, the couple of days after Thanksgiving was probably the first time that it was mentioned. Bob: And you brought it up? I call him, and he answers. He said, “We’ll have to talk about this later.” I said: “No; we will talk about it right now. This is groundbreaking/life-changing. We’ve never even joked about something like this.” He had just kind of, I think, spiritually had kind of checked out. I didn’t see that, because I was super overwhelmed in motherhood. A few weeks later, he physically left. It was just a few weeks later—two days after Christmas. It was the worst Christmas ever—I mean, I had bought him a new wedding ring; because one had been lost in this Muddy Buddy thing that you do where you crawl through the mud, which was completely innocent that it fell off of his hand. I was literally grasping at anything that Christmas—like, “Here’s a new wedding ring.” I got him some dog tags if he ever had an accident riding his bike—just different things that were just showing him, “How well I knew you,”—bought him his favorite kinds of undershirts. In his stocking, he has a few quirky things that—he’s just a huge fan of ChapStick®, and toothpicks, and original Crest® toothpaste. —she has slathered it on at Christmas. Dennis: And two days later, you pack up and leave. Tiffany: He was done; yes. Dennis: Take us to that day. What were you thinking, and how did you do that? I mean, what a time of the year to disappear. Jeremy: I think we barely made it through Christmas. She got all that stuff, but it was just sort of opened and put to the side; because there was no emotion there. Tiffany: All the darkness that he had now welcomed into his life was pulling him. Jeremy: It was pulling me away. I honestly—it was like: “I’m going to make it through Christmas, and that’s it! That’s all I can do.” So on December 27, we were separated; and it literally all came crashing down. Bob: You had already left. Jeremy: I was numb to it. Bob: So, how did you sit down with three kids and say, “Dad’s leaving”? Jeremy: We didn’t. You know, I think that God protected our children during this time. We got with the counselor; and the counselor said: “I think that you don’t need to talk with your children about this at all right now. I think that you need to work on this and continue to work on this. “If there’s ever a chance of having any hope, then leave them out of this at the time being.” So, that’s what we did. Dennis: I’ll stop you there—“Ever a chance of any hope.” So there had to be a glimmer of hope there—that you were protecting your kids in the midst of this. Jeremy: I think that God used that. I don’t know how, because I was in a very dark place. I don’t know how that happened, but it did; and I’m extremely thankful for it. Tiffany: They were—just for anyone listening with children—they were three, five, and seven. I realize that, when children are significantly older than that, you can’t just hide that from them. But at three, five, and almost seven, I got really creative with the truth. Jeremy: Tiffany told them that I was working on a project. The project was the project of his heart, and I was holding onto hope [Emotion in voice]. Dennis: So did you tell your dad? You had to tell your dad. Jeremy: Yes; I told him. Tiffany: Oh, yes; he sat down and told his whole family. Jeremy: I told my whole family. Dennis: And?—what did they say? Jeremy: Well, they were all very upset. They sat around and prayed for me, which I didn’t really want. You know, they really wanted us to work through our issues. They didn’t want us to just jump back in to things—they wanted us to work on issues. Tiffany: They were Team Jeremy and Tiffany. That is so important if your family member is going through something like this. They didn’t take a side. Jeremy: They were never for me, ever. Bob: They were on the side of the two of you together. Tiffany: The two of us. Jeremy: Yes. No one in my family was: “Well, Jeremy, I’ve seen this. You know, you had every right.” That was difficult, because I think most people would expect their family to be for them and only for them. Dennis: Unpack that a bit. How was that difficult for you? Dennis: They recognized that you two were one. Dennis: And they were still going to treat you as both—you know, I think that’s brilliant. Tiffany: Well, my mother-in-law—I remember her saying: “If this goes down, and he continues to live in darkness, you and the children will come at Christmas. He can come by some other time.” So she wasn’t taking my side, but she stood for truth—she said, “You’re my daughter-in-law forever,” and I will ever be grateful for that. Bob: And I just have to ask—you said, Tiffany, that you got creative with the truth with the kids; but on December 27, when you went to bed that night, you couldn’t get creative with the truth with yourself. Tiffany: No. We just didn’t discuss it. In fact, it was like a funeral, almost, that night; because our closest net group of friends all came to the house. They were all gathered around my bed—I don’t know why we were in my room, but we happened to be in there. I was just sitting on the bed, crying; and they were gathered around me. Just this community came together and said: “You know, we’ve been afraid to tell you that you’re really selfish. We’ve been afraid to tell you that you talk too much. We’ve been afraid to tell you that you seem completely unavailable and too busy all the time.” Those were painful to hear, because I’m already kind of digesting that my husband has left; but I will never, ever be able to say how much love I felt from friends—[Emotion in voice]—friends who love you enough to say what’s hard. Tiffany: —which goes back to why it’s important to have community in the first place. Bob: —because a marriage had died. Bob: But as you tell in the book, Need You Now, the death was not the end. Dennis: And what I want our listeners to hear in this is that neither Jeremy’s family nor their friends, who surrounded you, Tiffany, took sides. Dennis: I think the message of this for the Christian community is: “Love somebody enough to tell them the truth. Don’t bad-mouth the person who’s leaving. Love them too. This is where the Christian message—it’s a message of Easter. Dennis: Do we believe that or not?! Yes! The same power that raised Christ from the dead lives in you—the Holy Spirit—and He can do something new in a broken, dead marriage. Bob: And we have seen that happen so many times at our Weekend to Remember marriage getaways, where couples come with a loss of hope and with no idea how to repair the damage that’s been done. God meets them there and provides both help and hope through His Word and through the work of the Spirit in their lives. I think you guys know that most of the people who come to these getaways are folks who are in decent shape in their marriage—they’re folks coming for a tune-up. But there are folks, who are coming, who are at the end of their marriage; and they wonder if there’s any hope left. It’s encouraging to see God work in their lives. I mention all of this because, over the next couple of days, our listeners have an opportunity to sign up to attend one of our upcoming getaways. If you pay for yourself, your spouse comes free—it’s a buy one/get one free opportunity—it’s good through this weekend. We’re encouraging you to go to FamilyLifeToday.com and learn more about our getaways—find out when there’s one coming to a city near where you live. Register online or call 1-800-FL-TODAY to register. Take advantage of the special offer that’s going on through this weekend. If you have any questions, give us a call at 1-800-FL-TODAY; but we hope to see you this fall at one of our upcoming getaways. 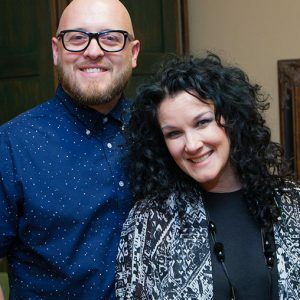 Let me encourage you, while you’re online at FamilyLifeToday.com, look for information about the book that Plumb has written—called Need You Now, which is also the name of her new music CD. We have both the book and the CD in our FamilyLife Today Resource Center. The book is a story of hope. It’s the story we’re hearing this week, and it’s a story that you may want to either read for yourself or buy for someone and pass on to them if they’re in a marriage where hope has been lost. Order from us online, or call 1-800-FL-TODAY to get either the book or the audio CD from Plumb. We have some special friends to whom we want to say “Happy anniversary!” to today. Dennis and Carolyn Sapp are celebrating their 55th wedding anniversary today. I say they’re special friends because they’re colleagues—they’re co-workers, here at FamilyLife. Dennis and Carolyn travel to our Weekend to Remember getaways and help with all the administrative requirements to put on an event like this. They’ve been doing it for a couple of decades now—just a great couple. As they celebrate their 55th wedding anniversary today, “Congratulations!” to Dennis and Carolyn and to all of you who are celebrating an anniversary today. Every year, your anniversary matters. It makes a difference—it’s a mile marker of faithfulness. FamilyLife’s been celebrating our 40th anniversary this year. All of what we do, here at FamilyLife, happens because of friends, like you, who make it possible for a ministry like ours to continue. We’re listener-supported—your donations keep this program on the air and online / keep our events coming. All that we do is fueled by friends like you. If you’re able to help with a donation today, we’d love to send you the 2017 FamilyLife calendar. It’s all about how you can make your home an embassy and how you can live as an ambassador for Christ. Actually, the first month on the calendar is October of 2016; so you can put it right to work as soon as you receive your calendar. Make your donation online at FamilyLifeToday.com, or call 1-800-FL-TODAY and request your copy of our 2017 calendar. And be sure to join us back tomorrow when we’re going to hear about the resurrection of Jeremy and Tiffany Lee’s marriage. It’s a great story. Hope you can be here.